Do you want to be perfectly equipped for Cuba? This chapter will explain the main thoughts behind the gear I have used for all kind of fly fishing in Las Salinas and Rio Hatiguanico. Bonefish @ Las Salinas The bonefish setup for Las Salinas is very simple. In that time I was fishing with a custom built 9 weight Sage Xi3 and a Sage 6010 reel. This was a great combo to fish for bonefish but the time changed and now I would much more recommend a lighter rod for this kind of fishing. I now recommend my most favorite bonefish outfit. An 8 weight Sage ONE, 9 feet long, that already worked perfectly in Aitutaki. But nevertheless, each 7 to 9 weight rod will do the job. In terms of reel, I was using an excellent performing Sage 6010. Take care that you do have enough backing on the reel. The bones there were not as big as in Aitutaki but in every case a bonefish is a tough fighter and you need a lot of backing. I recommend to have at least 150 yards of backing for the save side. In most of the cases you don’t need that much but you never know. Reckon with the best and prepare for the worst. If you do have a reel not constructed to hold that much backing, use Gelspun backing that comes with a smaller diameter by even a higher breaking strength. I’m using a 50lbs gelspun backing on all my reels except my the Monster where I use 80lbs gelspun. For the lines I have a clear recommendation. RIO Bonefish WF8 or WF9 matching to your bonefish rod. It worked perfectly on the Cuban flats. The flats there are not very deep. In many cases not deeper than 2 maximum 3 feet. The bottom is mixed hard to little muddy. I didn’t use any other line for bonefish than this one over there. For leader and tippets bring 20lb and 15-16lbs of Fluorocarbon. You need a nine to ten feet long leader with a 15-16lbs tip section. A simple two section leader is sufficient and will do the job. Loop to loop it with a perfection loop to the fly line and a rapala knot to tie the fly. Leader: Fluoro carbon saltwater tippet 20 + 16lbs. Nine to ten feet long. 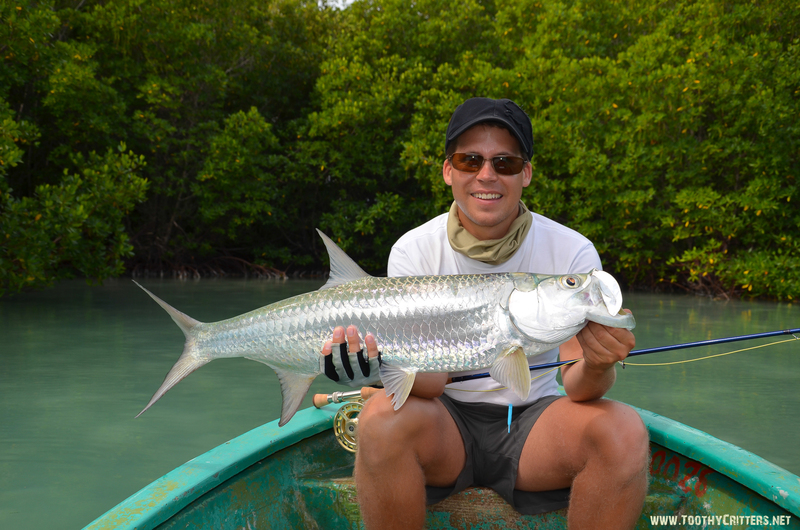 In the mangrove areas in Las Salinas and also the channels around there you will meet tarpons. They can grow up to descent sizes even up to 100 pounds or more. You will need a good solid rod and reel combo to be prepared also for bigger fish. I was very happy with my, at that time, strongest tackle I owned. A Sage Xi3 10 weight. The 10 weight Xi3 is a beast. Some companies would declare it as a 11 or 12 weight. Compared to the tarpons on the river the tarpons on the flats were not even half as strong. A 10 weight rod is by far strong enough as long as you do not specifically target the tarpons in the channels. A good and strong reel you will need definitely with the obligatory high amount of backing. For the lines it becomes easy again. I was using a half intermediate tip fly line such as the RIO Tarpon in 400 grains to get the fly faster to the fish. The first 15 feet were intermediate and perfect for the mid deep mangrove areas and channels. For the deeper channels a faster sinking fly line wouldn’t be a bad choice too. The channels can get very much deep and together with the current you need a faster sinking line. You also have the chance to catch snapper there with this kind of fishing. Since I was more focused on the bones I didn’t tried this kind of fishing intensively. For Leader the choice to bring is a 60 to 80lbs of fluoro carbon. I was using only single section leaders made from 60lbs or 80lbs FC, straight for 6 to 7 feet. On the river you need a really really tough rod. I can’t recommend anything below a 10 weight rod. 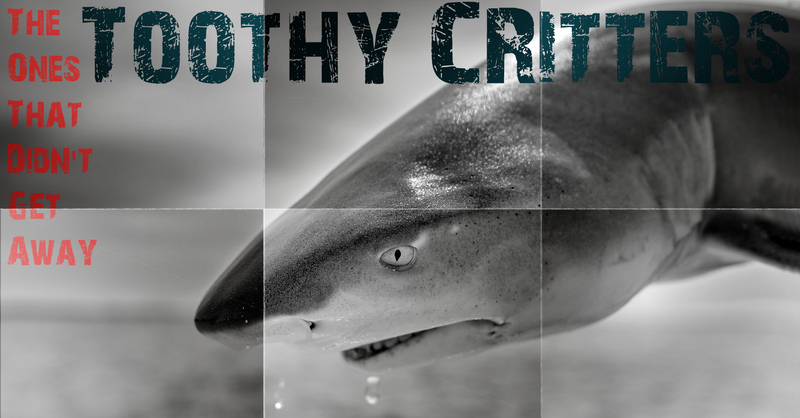 Since the lack of space to fight the tarpon you will need to stop him as soon as possible. 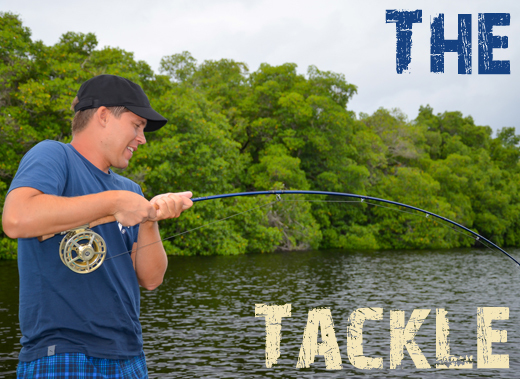 Get the tarpon on the reel and increase braking strength by supporting the breaking with your hand. Take care of the reel knob!! I can’t imagine a harder challenge for a rod than those tarpons there. Like on the flat I was using my 10 weight Xi3 for the fishery there. The fly reel plays a minor role. You won’t see much of your backing there. The more you fish to the end of the river the wider it gets and bigger the tarpons. This increases the need for backing since you can allow the fish to swim. Interesting is that the bigger the tarpons are the less they jump. As a fly line I received a recommended by the local guides. A line that sinks really fast and brings the fly to the fish. The majority of fish swims in and out of the mangroves so this is the place where your fly should be in a depth of roughly 3-4 feet. My choice was the RIO Leviathan 26ft sink tip in 400 grains. Good to cast and with the higher breaking strength ready to stand the battle. Don’t use anything that sinks less fast than the Leviathan. And bring a spare fly line since you can easily loose a fly line there when a fish makes it into the mangroves. 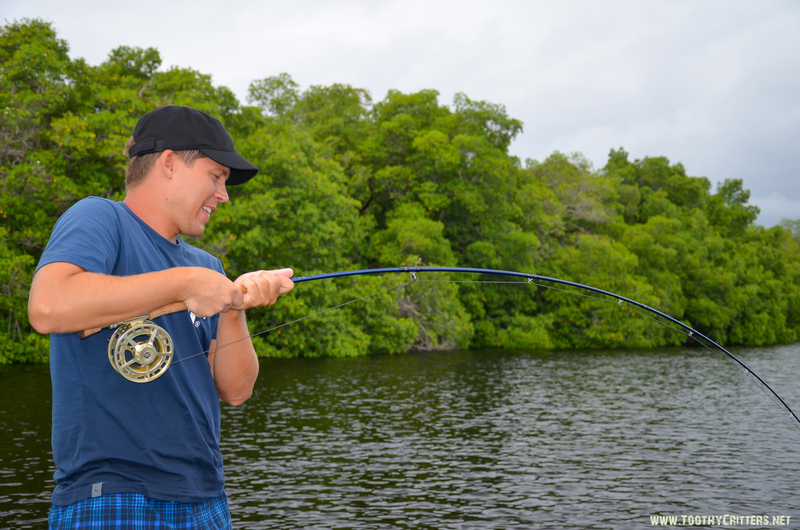 The same fly line you can also use on the Cayos fishing from the bridges. The leaders can be set up very simple with just 5 feet of straight 80lbs of fluoro carbon. Perfection loop for connection to the fly line and rapala knot to tie the fly. Rinse your gear with sweet water after each fishing day to keep it working for long time. This entry was posted in Blog, Cuba 2012, Worldwide Travel Reports.